The Edinburgh Drawing Room - Luxury City Centre Apartment in Central Location. 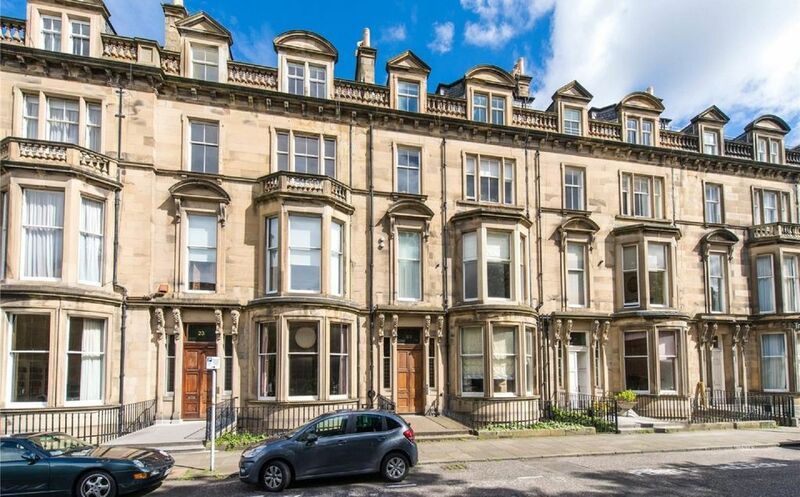 The Edinburgh Drawing Room is a luxury 1 bedroom apartment situated on Learmonth Terrace - a 10 minute walk from Princes Street, 5 minutes from Stockbridge and within walking distance of numerous Edinburgh landmarks. High speed fibre Wi-Fi is provided throughout the apartment. The stunning drawing room / kitchen contains many original features and a magnificent full length bay window with views over Learmonth Terrace gardens. The open plan drawing / kitchen / dining room has comfortable seating and a dining area, with table, and kitchen area with breakfast bar and stools. The spacious bedroom has a king size bed, triple wardrobe with plenty of storage and a dressing table. There is also contemporary bathroom with shower. The apartment is located on the 1st floor and is accessed through a beautiful shared entrance with lift and stairs. - Large drawing room with dining area. 55" LCD Television with Freeview and Internet Connectivity to Apps. Radio / Speaker with connectivity cable for phones / mp3 players. We had a wonderful stay here. The apartment is beautiful, close to the city centre (easy to walk) and close to the Modern Art museum. Wonderful hosts. We had a wonderful stay at this property. Easy walk to Edinburgh city centre and very close amenities. Claire and Ian have thought of everything in the flat for a comfortable and stylish stay for 2 persons. The welcome basket was an unexpected surprise. The flat was impeccably clean and is bigger than expected. The owners are attentive to every details and all instructions are crystal clear. All Edinburgh's feature are accessible by simply walking without any effort or buses stop nearby. We highly recommend this property which went beyond our expectation. Lovely period apartment not too far from the city. So, nice that we stayed in most evenings after exploring Edinburgh during the day. Very clean with all the basics that you might need for a few days stay and parking outside to make life easy. A very neat and tidy home. The ceilings had 20 feet. Old and charming. Ian and Claire were wonderful host. Victorian grandeur with a homely, cosy vibe! We had a wonderful mid-week break. A very comfortable base for exploring the sights of this lovely historical city. Highly recommend a stroll from the apartment, through Stockbridge to visit the Botanical gardens (very good restaurant in visitor centre). Only negative comment, some noise from mid-week commuter traffic a little intrusive in the early hours. Claire and Ian were great hosts, a couple of minor glitches sorted very efficiently. The apartment and neighbourhood were perfect for our first visit to Edinburgh. Spacious accommodations, and all amenities in good working order. Bus stop right out the front door, and walking distance to Stockbridge neighbourhood shops and restaurants. Claire was accommodating, and quick to answer our texts. Would definitely stay here again.